Here at Bob Hopper we have over 30 years of experience designing, installing and maintaining commercial kitchens. Our vast experience is invaluable when it comes to the design, layout, fabrication, installation and maintenance of your catering kitchen. We assist with layout options, flooring specification, water, gas and electricity requirements, storage, preparation areas, refrigeration, ovens, grills, washers, ventilation, hygiene and lighting. We will advise you throughout the design process with our recommendations for equipment to suit your needs, budget and circumstances. Working closely with all the major brands that supply professional catering equipment you can be assured of getting quality equipment that will function day in, day out for years to come. 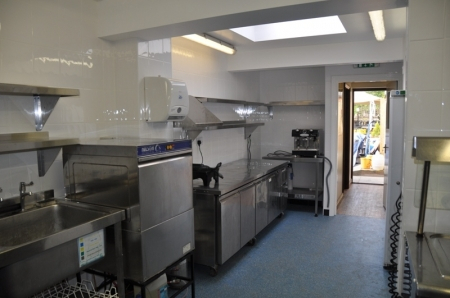 If your commercial kitchen is looking a bit tired or no longer meets the needs of your business then we can re-design, renovate or revamp it to bring it up-to-date and improve safety and efficiency. We are able to re-use equipment where possible if desired, any existing electrical and gas equipment would be serviced and overhauled to ensure continued reliability and safety. All our installations are carried out by professional, certified engineers including electricians and Gas Safe fitters to ensure your continued safety. Working within current planning, building regulations, health & safety and environmental health guidelines in our designs, we also assist with on-going safety issues including fire blankets and extinguishers, further PAT and Gas Safe testing, flooring upgrades and general equipment servicing. We can supply custom items where necessary including everything from shelving to storage and stainless steel work surfaces. Bespoke extraction hoods, sinks, serving counters, cupboards, storage and shelves can be fabricated if no off-the-shelf equipment options are available.